When it comes to catering, it is the experience that makes the impression. Any Event at The Rock designers and our team of professionals are here to help with all aspects of your event, from finding the perfect setting in the Sierra Foothills and the coordination of the event, to the gift basket amenities we will provide to your out of town guests. Any Event at The Rock was born because we want to create the perfect event for your special date. Any Event at The Rock can arrange for your Beverages (excluding hard alcohol), and coffee service for your celebration. Our staff sommeliers can help you pair your champagnes and wines with your food selections or create a custom specialty drink to toast the special day, all to fit your budget and tastes. We can purchase wholesale for our customers. Any Event at The Rock has served beautiful brides and guests for 10 years. Service with a smile. We have serviced the Sierra Reparatory Theatre Gala Dinner, Habitat for Humanity of Tuolumne County’s major fundraiser for 400 plus guests, Sonora Regional Hospital Christmas Dinner 1700 Guests. 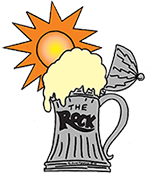 We have linens, china, silver flatware, water goblets, pint, wine, champagne flutes, beverage dispensers are part of the equipment selection provided by Any Event at The Rock. We have a 20 x 8.5 Foot trailer with equipment that makes us self-contained.